Dr Christopher Baker joined the Social Investment and Philanthropy research team at Swinburne in January 2010 following the submission of his PhD thesis on charitable bequests in Australia. His research at CSI Swinburne has ranged across quantitative and qualitative studies focused on private giving for public good, in its multiple forms. 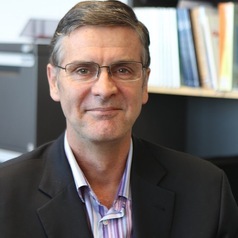 His pre-academic career spaned over 25 years experience in leading people and managing change, during which his roles included Senior Executive at ANZ, and Chair of The Salvation Army Employment Plus. Christopher is both researcher and participant in the Australian philanthropic sector, where he is currently Chair of the Board of the Inner North Community Foundation, and a sub-fund holder. Throughout 2016 Christopher directed most of his research effort to Giving Australia 2016; a landmark study into giving and volunteering in Australia commissioned by the Prime Minister’s Community Business Partnership. Partnering in this major research project led by the Australian Centre for Philanthropy and Nonprofit Studies at QUT, Christopher has been active in collecting and analysing comprehensive, contemporary information on giving and volunteering throughout Australia.